As some of the keen-eyed among you noted from last week's update, there was an unfamiliar portrait in our work-in-progress tileset screenshot. We read the debates and viewed the Blade Runner-esque enhanced images that followed with interest. Good work, sleuths, the character pictured is, in fact, an orlan. This orlan is engaged in some important work in one of the Dyrwood's busiest cities. Here's the full-sized portrait for your continued speculation! Hello all. This week, I will be writing the update, and we’ll be starting to talk a bit about world development. For a designer, this is the fun part, and it’s a surprisingly rare opportunity. On all my previous Obsidian projects, the team has worked with an established IP (intellectual property) like the Forgotten Realms or Fallout. We’ve always had a wealth of existing lore to draw upon – cities, towns, characters, history, gods, etc. Sometimes we’ve worked in an area of the world that hadn’t been seen in a CRPG before (as in NWN2: Mask of the Betrayer), which gave us the opportunity to extrapolate beyond what was already established... but otherwise, we were working with established material and trying to be true to existing lore. In contrast, Project Eternity is an entirely new setting that we’re creating from scratch. And at the start of development (around the end of the Kickstarter campaign), we didn’t have much more than what KS supporters have already seen: a map, a few high-level ideas about races, nations, and technology level, and the idea that souls play a major role in this world. One of our first steps was to think about gods. Deities can be a good starting point when developing a world. They reflect the views and beliefs of the world’s inhabitants, and they can inspire ideas for characters, organizations, and conflicts. Woedica – "The Exiled Queen"
A lot of my design ideas start with a visual image. That applies to characters, locations, even narrative. I’m not sure where most of them come from, but examining them more closely will usually lead me to develop stories to explain who they are and where they came from. One of the first images that sprang to mind was an old woman – a dethroned queen – wandering along an empty road in tattered finery. Despite whatever horrors she had suffered, she maintained a certain stubborn dignity, and she carried a heavy book of law. I felt like this goddess could cover a range of portfolios, and I liked the idea that the deity who was the "rightful ruler" of the gods (in her mind, at least), had lost her throne. That may have some interesting implications for the way in which mortals view the world. So what was her story? According to her followers, she had once claimed rulership over all the other gods. But if that was true, she was cast down in the far distant past. Among the other gods, she has no real allies, believing that all the gods owe her fealty. She claims the portfolios of law, rightful rulership, memory, and vengeance. And she manifests in the world as the Strangler, a leathery-skinned old woman, always clad in tattered finery, who appears on an empty road or abandoned alleyway to murder those who break a solemn oath. There’s a lot more to tell about the Exiled Queen and the other gods (some of which aren’t even “human”). But that should give you a taste of our creative process. We’ll have plenty more to say about world-building in future updates. 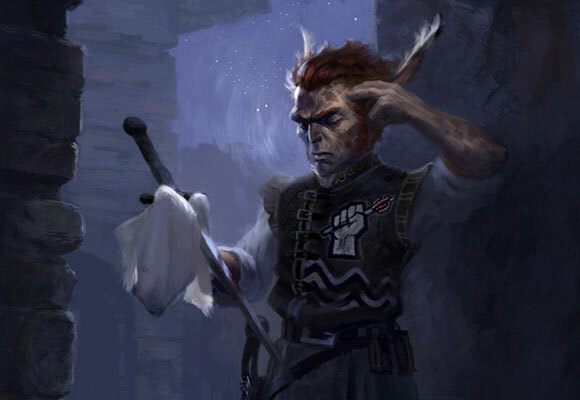 I'm getting a Tyrion Lannister with an even more developed mind vibe from the Orlan Cipher, sounds very interesting. Nice update! I enjoyed both the tantalizing illustration and the description and implications of Woedica. Thank you. 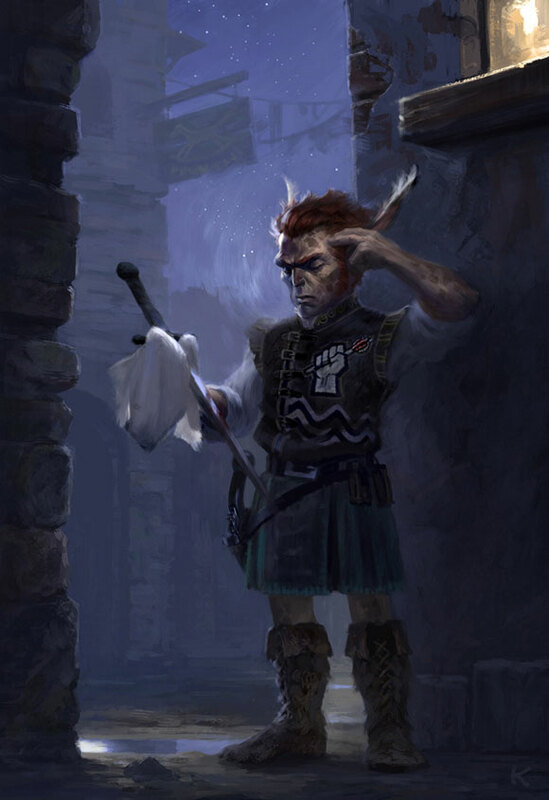 So Orlans are basically a leprechaun-hobbit-gnome-crossover with sideburns? Awesome! I get a Scottish vibe - well apart from that Doublet design, which is odd but interesting. Intriguing. Also, I'm getting a major PS:T vibe from Woedica. I'm really really really really looking forward to that. +1 for Old English feel. "Using this blood-stained dagger and my amazing cipher mind skills, I can deduce the last user of this weapon and thus identify the killer. Quite elementary my dear chaps." Very cool. Also liking the god update. Can't wait for an animal god/creature god. Is it possible that societal change can influence a gods standing? Say an old god of hunter gatherers suddenly becomes obsolete when the agrarian revolution takes place, and the gods of the herd and the field suddenly gain dominance. Thanks Josh and George! I like the Orlan design. It's not too "creaturey". Is this a new companion, then? I'm interested in you guys' take on the pantheon. Seems reminiscent of Greek myth, but I get the sense that the gods aren't quite as powerful. Or maybe the fact that people are using magic in this world just levels the playing field a bit? Can't wait to hear more. I've never been a huge fan of these pantheons composed of many relatively weak deities that only care about something extremely specific (i.e. either death, or trade, or luck, etc), and still ask for the same kind of jealous devotion as the universal god Yahweh of the Bible, or Allah of the Quran. It's kind of a contradiction to only provide for a few specific needs and expect exclusive adoration in return. In the Bible Yahweh asks for complete exclusive devotion to him, but that's because all the other "gods" don't actually exist and Yahweh is absolutely ****ing omnipotent. So Yahweh's in a pretty good spot to ask for exclusive adoration. The D&D gods are not. They're not omnipotent, they haven't always existed, they won't always exist either, most of them haven't created much at all, most of them only care about a few specific things. They're basically just souped-up humans with obsessive compulsive addictions to certain things. Also it's kinda silly for all these priests of deity X to claim their deity is the one true god in a system where there's many different real gods and everyone is aware of that including themselves. Add to that that all these gods are petty and mortal, and the silliness just gets out of control. Either make people behave in a way that's consistent with these many deities' relative importance (i.e. they would usually pray to several different gods, for instance), or change the pantheon to make the gods worthy of the exclusive reverence they expect. As it stood in D&D it just wasn't believable. it could be like tes daedras and aedras type worship, where none except the extreme fanatical claim theirs is the true gods but more inline with they worship the deity that fits to their personality or a deity that they feel can benefit from. If its going with the greek style range of gods, then I believe the citizens of the land just worship the deitys they feel represents their values or needs. They all know that this isnt the ONLY deity and that there are others. Itd be like they can pick and chose or have their culture favor or force citizens to worship certain ones. I dont think ull see people stating theirs is the only deity unless they are deranged, fanagic, or ignorant. The pantheon is sounding pretty cool so far, it will be interesting to learn of these gods/esses interactions in the world and amongst themselves. Furthermore, what is the symbol on the Orlan's uniform? I suspect it's a hand holding a scepter, or maybe an arrow caught in flight (preventing violent crime?). Nice update. Cool portrait - background work in the portrait is impressive as well. "Her Aedyran name is Woedica, which evokes the “Old English” feel of the Aedyran language. (Maintaining a distinct sense of national/ethnic language and culture is important to us – more about that in a later update.)" I like idea that there is no straightforward alignments inside of the pantheon. Because it gives more room to make gods interesting and gives possibility where gods agenda from one perspective is good and from another perspective it's bad/evil. For example one god's agenda could be keeping rightful king in throne, as it's his divine right to rule, but this king is tyrant, which is why there is another god who wants him to be replaced by someone who s/he see fitting better on the throne, which is young girl who don't have any schooling what so ever as she was raised by family of farmers. Or some other not so clicheic scenario where there is no true answer to tell which of the options is good or bad/evil. I also like how orlan looks in the picture. The people who partake in an polytheism belief system often do not claim one god is "the one true god". Normally, these people align themselves or ask for help with the god they think will help them the most. This alignment can change depending on the situation like a mother praying to the god of childbirth or a farmer praying to a god that is suppose to make the ground fertile. This might sound silly but it was a very popular belief in ancient times. The Greek culture, which most of this is based on, had a pantheon of 12 main gods and an uncountable number of lesser gods. Most of the people worshiped many gods while priests limited it to one. Also the D&D gods do have a great deal of power. They are able to give their most devout followers, templars and priests, special powers that aid them in dire situations. Personally, I like the pantheon system. It often creates a rich world that is fun to play in. I'm having a hard time following the concept of many gods and souls being an important part of the story. From what I gathered previously, your magical ability is enhanced by your purity of your soul. I don't understand how the gods relate from what was shared so far. Wow, already the 40th update! And then we get to see a Sherlock cipher with clan vibes, and also a wonderful pantheon insight from mr Ziets! I couldnät be happier. And I really do like your approach to religion and gods, it's well-informed and fits the great variety of a big RPG like this. How exciting! Can't wait to dive into your world. Maybe gods allow you to 'reset' your soul, so the wicked can get a second chance (Just give us lots of gold), or at least they give the impression of being able to do so. No traditional wizard worth his pointy hat could possibly work by the light of pure, smooth, dare one say virgin undribbled candles. It would just not look right. The ambience would be totally shattered. And when it did happen, the luckless wizard would mess about, as people do, with matchsticks and bent paperclips, to try to get nice little dribbles and channels of wax, as nature intended. However, this sort of thing never really works and invariably ends with wax all over the carpet and the wizard setting himself on fire. Candle dribbling, it has been decreed, is a job for a dribbler. – Terry Pratchett, Unseen Academicals. Wow, I got chills when reading the description of Woedica. Great update. Thank you! Does no god at all really remember what she used to do/how she ruled? I'm a fan of the Exiled Queen and a nice hook as her being a bane for oath breakers. I love those kinds of things so much I finally got around to making an account. When it comes to gods one thing that conufses me is what sort of god would willingly take on the portfolio of "Greed" or any other negative describing word? I would imagine they would try and put a positive spin on it and say they are the god of "Wealth" or "Luxury"
Hei guys, not to spoil the nice update and I know raised fists are common symbols for resistance, but would you mind picking another color or so for the orlans raised fist symbol?